Soak red beans in water overnight or for 6 hrs. Wash and pressure cook with 1 1/4 cups of water, on low flame for 8 minutes after the first whistle. Allow it to cool. Discard the left over water and put it into a pan. 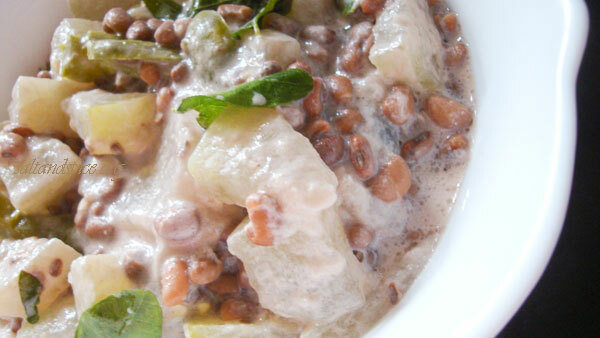 Peel, wash and cut the ash gourd into cubes. Cook it along with the beans by adding 1 1/2 cups of water, green chillies and salt. Keep covered and stir in between. When almost done, add curry leaves. Cook till the pieces are soft and tender. Add the thick coconut milk, mix well and put off the flame. Pour 1 tbsp of coconut oil over ‘Olan’ and mix well. Keep covered for a few minutes before serving. ‘Olan’ is an essential part of ‘Onasadhya’. It is very different from the spicy curries. 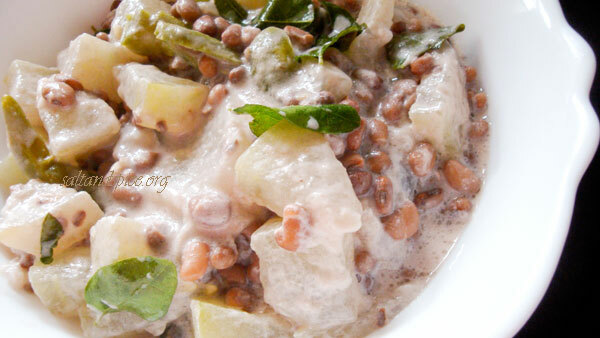 Yummy ‘Olan’ makes a very good accompaniment for steamed rice. 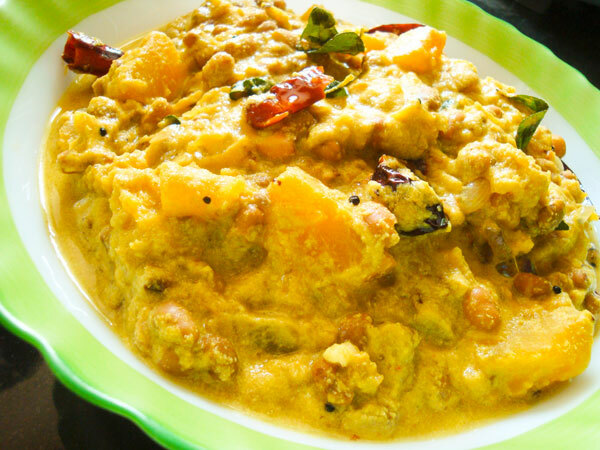 Delicious olan eniku vishakunne..:)wish u & ur family happy onam. Love love olan and this looks so so good. Thank you for posting the onam recipes, I prepared olan for the first time and it came out well. I just knew the name olan, didn’t know how it looked like and the taste.. This came out well and we had a great onam sadhya with all the new things, my friends Anitha and Jerome liked it too.. 🙂 Thank you!